A well-cooked steak is the ultimate meal for many meat-lovers; charred on the outside, rare in the middle, meltingly tender and deeply delicious. Despite it being a firm favourite, people are often nervous of cooking steak at home but they needn't be. It's really very simple if you follow a few basic rules, the first of which being buy good beef. Here, more than ever, the finished results will depend greatly on the quality of the meat you buy. The colour of the meat should be a deep red; avoid grey or pale meat. Look for marbling in the meat as this provides the flavour. Avoid meat with a lot of sinew as this will be tough and unpleasant. Always buy the best meat available from your butcher and ensure it has been hung for at least 21 days. It is a good idea to start by getting to know the different cuts of steak available. Fillet: this is the most prime cut and the leanest. Coming from the middle of the cow, it is an unworked muscle and therefore is the most tender and requires very little cooking. For this reason, it fetches the highest prices. Sirloin: still very tender but with more fat and marbling, sirloin has more flavour than fillet but is still lean. Rump: a cheaper cut, rump is tougher than sirloin but more flavourful. 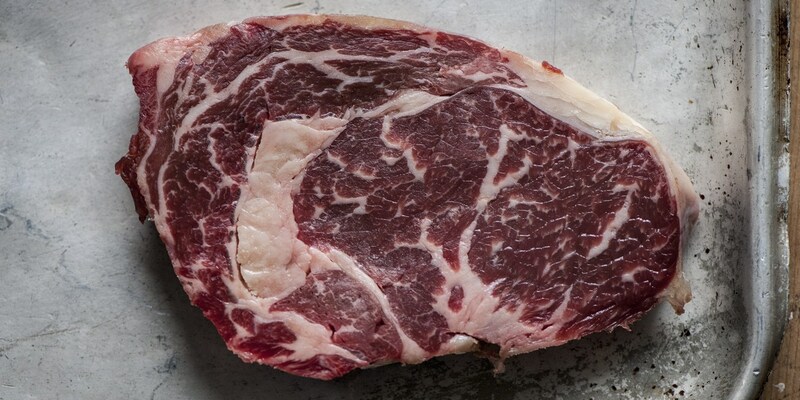 Rib-eye: often the most prized of all steaks, the rib-eye should be full of fat and marbling. This robust cut is rich and beefy and stands up to very high heats making it perfect for barbecuing. T-bone: or porterhouse, the largest cut of steak, combining both the sirloin on one side of the bone and fillet on the other. Less well known cuts of steak include bavette (also known as a minute steak), feather, flank, onglet and skirt (also known as hanger steak). These are tougher cuts and require more careful cooking. Steak requires little cooking and therefore suits methods such as barbecuing and pan-frying. Always allow the meat to come to room temperature before cooking. It is also important to make sure the pan or grill is very hot before beginning in order to sear the meat which gives it flavour. Once the steak is cooked, it is imperative that it is left to rest for the same amount of time it has been cooked. This lets the juices in the meat evenly redistribute and the muscles relax, making for a more tender steak. Rare: mostly raw in the middle, very soft to the touch. Medium Rare: pink in the middle, a lot of juices running, still soft to the touch. Medium: still some pink in the middle with a little blood remaining, firm to the touch. Well done: completely cooked through, the meat will feel very firm to the touch and have less juice running. Béarnaise: a French classic, it’s made with egg yolks, butter, shallots, white wine, vinegar and herbs (usually tarragon). Mushroom: generally consisting of mushrooms, garlic, stock, wine and cream, this unctuous sauce is a delight. Peppercorn (steak au poivre): steaks are rolled in crushed peppercorns, cooked as you would like them then a sauce made from shallots, butter, brandy and cream and red wine or stock is poured over. Red wine: super simple, light and tangy, a red wine sauce or reduction usually consists of just red wine, butter, stock and shallots; sometimes garlic and herbs are added. Bordelaise: a classic French sauce from the Bordeaux region. It is made with dry red wine, bone marrow, butter, shallots and jus. Mustard, blue cheese and herb butter also go beautifully with steak.